I don’t know how many quilts my paternal grandmother, Myrtle Hazel ROOP, made during her lifetime. I don’t remember ever seeing her work on cutting pieces and patching them together. 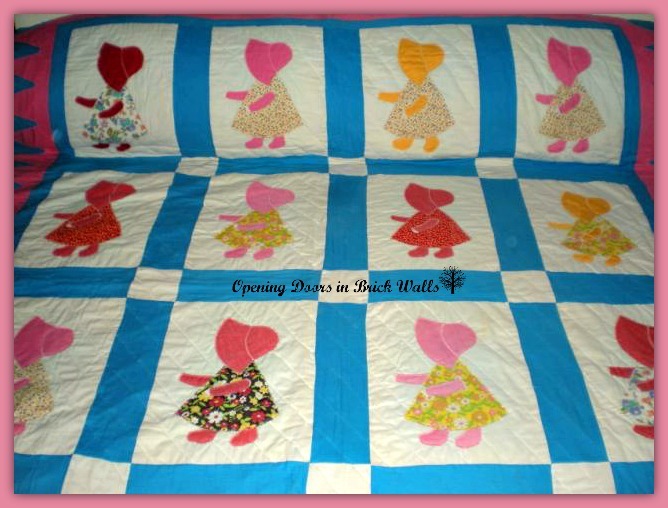 Around 1972 Grandma gave my sister and I each a twin size quilt with the sunbonnet motif. A closer look at the quilt shows she machine zig-zagged the motif onto the white background. She folded a tiny white square into a triangle for the girl’s hand. 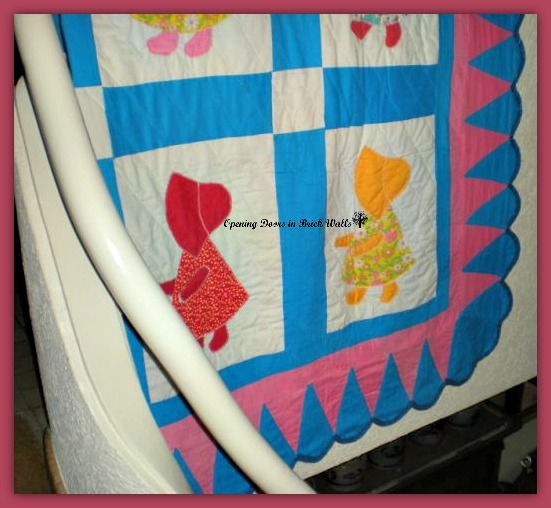 After sewing all the pieces together with the blue borders she added the scalloped pink and blue border. 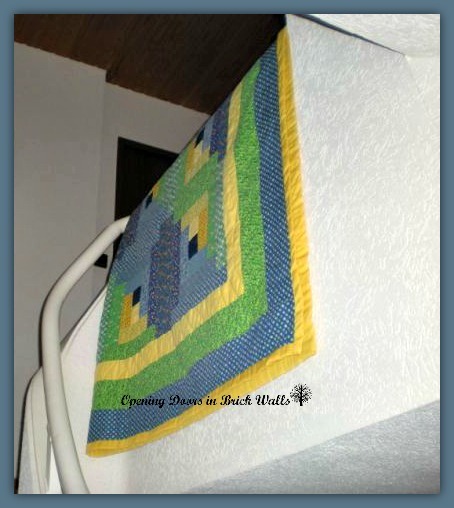 She hand-quilted around the edges of all the pieces of the motif and the scalloped border before quilting diagonal stitches across the entire quilt leaving off at the motif and outside border. She used material of blue and green tulips on a white background for the back. The backing material was already quilted to batting but it is still easy to see where the machine quilting was done and where Grandma’s tiny handmade stitches were made. I’ve taken great care with this quilt which is nearly 45 years old and still looks like new. Next door to my grandparents house in Victor Fayette County, West Virginia, was the school house where my Dad and his siblings went to school. The Victor School closed in 1955 and was then used by the ladies in the community as a meeting place for them to do their handiwork. Grandma told me she made her braided rugs and the ladies would do their quilting together in the school house. Grandma always did her quilting by hand and after they stopped using the school house,and when I lived with her the year I went to college, she had her quilting frame set up on the enclosed front porch of the family home. 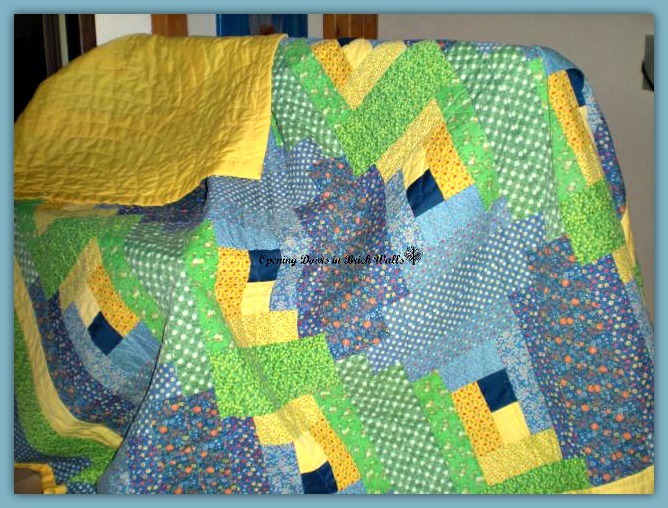 When I left after living with her for nearly a year I gave her a Log Cabin Block quilt kit with pre-cut pieces that I ordered for her through a magazine. When I got married the next year she sent me the finished queen size quilt as a wedding present. It will be 38 years old this March and is a bit more worn than the first quilt but still in prime condition. I have another quilt hidden away in the attic that Grandma gave to me when I visited her with my Mom in 1982. I need to make some time to go up in the attic and do some cleaning up and sorting. I might even find some more forgotten heirlooms. Log cabin is probably my favorite quilt pattern. Your collection is lovely. I only realized after I looked into how to quilt a few years ago how easy this pattern actually is. Simple but complicated when you see some of the amazing fabric combinations. Thank you Wendy. Beautiful quilts stitched with love! My paternal grandmother and great-grandmother quilted. I wanted to blog about them but left them in storage in the States so it will have to wait, but I like the blog idea. What treasures! How do you protect them? Clean them? Those are true heirlooms. I’ve had the bonnet quilt in a zippered plastic bag that a duvet came in. It might have been washed at least once in the washing machine and line dried. The log cabin quilt has been washed several times as I often use it as a top cover on our bed when it is too warm for a duvet. It has faded a bit but the back side is still bright. Thank you Amy. I received 3 tops from my Grandmother Sweeney/Rupe. Quilted 2 of them. I have one. my brother’s family had his quilted not sure were it is. 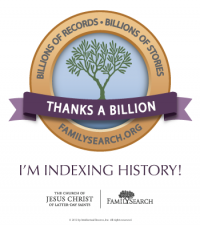 Looking forward to sharing with my grandchildren. Only thing from Rupe side. How wonderful that you have such beautiful heirlooms. I hope you have marked them somehow, not sure what is best for a quilt. A tiny tag pinned to the corner maybe? My grandmother hooked rugs, but sadly I don’t know whatever came of hers. I do have some of her tatting. Our grandmothers must have had very good eyesight and busy hands. While I was photographing them I realized I need to label them. I could use permanent markers on a piece of material and stitch it onto the quilt. Nicer but more time consuming would be to embroider the information. I’m afraid if a tag was pinned it might get ripped off by accident and cause damage to the quilt. Yes our grandmothers must have had good eyesight and their hands were always busy. Thank you Janice for taking the time to comment!! Cathy, I’m also fortunate to have three quilts from my grandmother Nettie Down Pegram Light (25 Jun 1890 – 12 Jun 1964). One she pieced for me, from kite-shaped patches of cotton. Another is in the “improved nine-patch” pattern –also cotton/feedsacks. The last, a “silk comforter” made from random rectangular pieces of synthetic fabrics, was “tied” instead of quilted. Grandma Light did sewing and quilting in her Salem neighborhood, to make a bit of extra money. I also inherited a quilt worked by my maternal grandmother, Lucy Margaret Rodes West (20 Oct 1872 – 21 Nov 1950) and her daughters Vivian Ivorine and Hermit Ollie–my mother. This unique quilt is pieced from wool suiting samples left by an itinerant tailor named Sam Buff, who traveled the coal towns on foot, measuring miners and taking order for custom-made suits. He always boarded with Grandma Lucy when in the Gatewood area, and they stitched his name across two of the blocks. The suiting rectangles are embroidered with with other motifs, including flowers and even insects, using bits of yarn and floss. The backing is cretonne — a printed fabric used for home furnishings and draperies–printed with exotic tropical birds and foilage. When I was last in Victor in 2010, we stopped at a little quilt shop just outside town, on Route 60. While browsing near the front of the store, a little water snake slithered right through the open door–bold as brass! I wonder if the old building might have been the school mentioned in your post. Your quilts must be beautiful especially the one pieced from wool suiting samples. I’d love to see photos of them!! After a while the school house was no longer used at all and sometime in the 1980s it was torn down and they used the lot as a parking lot for the school buses. Thank you Lucy for stopping by.